Trend Week and DT call at JUGS! This week over at Just Us Gi rls Vicki has picked a perfect trend for us! Watercoloring! This trend is so popular right now and let me just say that before you judge me on my feeble attempt…..it’s the Journey that is the important part right? And I have to say that I had a great time learning and watching this incredible video by Dawn Woleslagle over at Stamp Away with Me. OMG…is she ever talented!!! The resident art teacher in the house told me that I didn’t do so hot….in so many words! LOL Well, better luck next time! Yes, I am going to give this another shot very soon. I must say that I am very happy with my leaves…and hubby was too! Such a bummer that I rocked my stamp on my sentiment…oh well, what can you do! Of course then I go and add the two hearts next to it and draw attention to it…LOL The stamps are a mixture of an old (Flashy Florals) and current (Stippled Blossoms) SU set. The papers and ink are all SU as well! The sentiment is something I have had for YEARS! The two hearts are from Verve’s Take Note. Now before you go….Over at Just Us Girls this week we also have a DT search going on for a new Designer. So if this is something you might be interested in….. please come by and check out the details and also while your there you can see how fabulous the DT did with this challenge! Far better then me! Take care and hopefully you can find sometime this weekend to try your hand at watercoloring! Categories: Cards | Tags: Card making, Cards, rubber stamps, stamping, watercoloring | Permalink. OMGosh, Nancy! This is NOT a feeble attempt! It is just GORGEOUS! I LOVE your roses and those two little hearts are so SWEET! Fab distressing two! LOVE your card! You did fabulous! Those leaves are quite stunning! Nancy, this is really pretty! I think your flowers turned out great, especially the leaves, much better than my attempts. Love the distressed edges, too. Never even noticed a blunder! Your roses are so beautiful! Great card! I think you did a great job on your flowers! I watched Dawn’s video, and she is amazing. This is definitely something I am going to try. 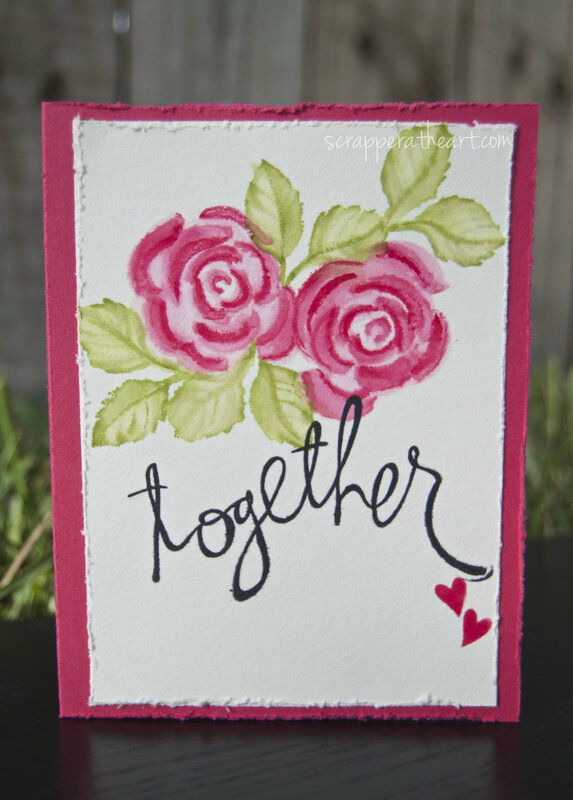 Beautiful card……great colors! I think you are too hard on yourself, Nancy, especially is this is your first try. The leaves are gorgeous and no one would have noticed the sentiment flub because they’re oohing and aahing over them I agree that Dawn is so talented and her videos superb. I think you did a great job! And practice does make perfect! Keep going! I think you are brave for tackling that technique that Dawn does! She is amazing! But I love your card…perfect sentiment for the card too! Pretty card! Watercoloring is SO much fun, isn’t it?!? Can’t wait to see what you create next! Nancy, you are WAY too hard on yourself! I’d say that’s an AWESOME card for a first try at water-colouring. It is a very forgiving medium–stuff happens that you never planned, when you add water… Thanks for your sweet comment on my STB entry this week. Thanks so much for your kind words…yes we tend to be our own worst critic. Thanks for brighten my day!